Amazing one-floor home that lives big for your Eastern Shore vacation. You will love its southern exposure and the sunshine that envelops this waterfront home with porch, patio, pool and deck. Situated on peaceful Edge Creek, the home was completely renovated in 2016 with top notch kitchen. It boasts three lovely water view bedrooms each with its own new bathroom that make sharing this house with friends or family a delight. The dock stretches into peaceful Edge Creek with approximately 3.5 feet of water depth, and 3 kayaks are provided at no charge to allow you to paddle up and down calm Edge Creek and enjoy the company of abundant heron, ibis, turtles and the occasional otter. A covered porch, six Adirondack chairs, a dining patio that seats 8, and a private deck off the dining room allow visitors varied places to embrace the calm. A 43-foot salt-chlorinated pool boasts gorgeous views of Edge Creek, and allows cool down on those hot summer days. Inside, you'll find a soaring living room ceiling with lots of open space, an adjacent dining room with water view, an open concept kitchen with bar, as well as spacious foyer, plenty of closets, and an office niche near the bedroom wing that allows an area to spread out your laptop or favorite craft project. For those who want to explore the area, this home can't be beat for its great location! The neighborhood allows for peaceful walks or bike rides down three lightly traveled shady lanes, but you are only 7 minutes to downtown St. Michaels and all of its charming and historic attractions. Historic Easton is 10 minutes away and the Oxford ferry is 7 minutes south if you want to cross the river and explore this village, too. You can also walk the 3/4 mile to the Royal Oak "town center' with its restaurant, two antique galleries, and post office. If you're like us, you probably don't want to leave Edge Creek too often, but will be glad for its amazing and convenient location. This home is licensed as a short term rental by Talbot County, Maryland ( # ST687-KAN-2018). 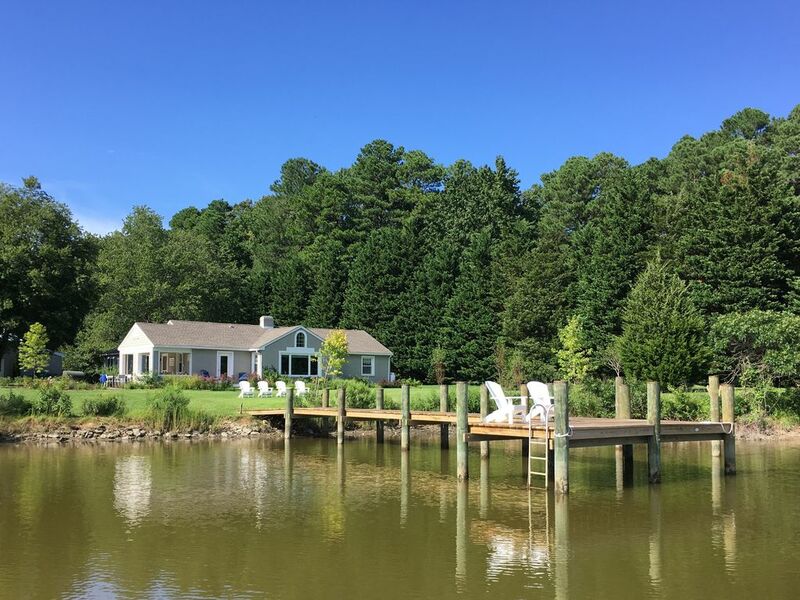 This is our second eastern shore vacation home and we are thrilled with this one, as it allows us a beautiful retreat along Edge Creek to share with our family and friends. We are an environmentally conscious family and we work keep our footprint light, and to appreciate the beauty of the the natural world that is so present in the Royal Oak area. We have been working to introduce more native plants and trees to his property to attract more wildlife, but we are excited to see abundant heron, bluebird, woodpecker, and ibis along the shoreline. Walking along Edge Creek Road and Thorneton Road is great, as there is little traffic, and always some nice shade in the summer. We loved this location and the beauty of Edge Creek. We appreciated that all of the kitchen and bathrooms are new, yet the original hardwood floors give a comfortable and established vibe. We also appreciate the bright sunshine that envelops all of the rooms and the porch that give us respite on hot summer days. The little village of Royal Oak is in walking distance with a post office, antiques shop and one restaurant open five evenings a week and on weekends for brunch and tea. All bedrooms, as well as the living room, dining room, and terraces have water views. The pool has a beautiful view of the creek, as well. The home is on quiet Edge Creek which widens as it finds its way to Broad Creek. Heron, ibis, and other waterfowl abound on the creek and you'll love watching the fish jump, too. Central air conditioning, with two zone and two separate thermostats. Central heating with two thermostats. Internet provided at no cost. Apple TV is provided to one television. Optional with linen service. No beach towels provided, so guests must bring own. Works well in all rooms and porch. Water view with 12' ceiling and new windows. Bosch gas range with hood. Two electric ovens, both wall ovens. Two slice toaster and blender provided. Provide basics: sugar, flour, some spices, coffee filters, paper towels, toilet paper, detergents. Full service of dishes and silverware to serve 10. Table indoors seats 8 with water views Breakfast bar with 3 bar stools for quick meals and snacks. Outdoor dining set seats 8 with lovely water view Additional porch seating adjacent to patio dining. We have a small library of novels for our guests to enjoy in the office. We have puzzles and games in the office. A level 1.5 acre property is great for Frisbee, badminton and more! 3 single kayaks provided that are 8', 9' and 10' in length. Guests are responsible to their return and safekeeping. Lost kayaks will results in a $400 charge per kayak. Two old bicycles are provided, however not guaranteed. Please bring your own bicycles or rent in town for best results. There is nice bike riding on the roads near Edge Creek Road. The pier has mooring slips. MLW is approximately 3-feet. Patio and separate deck off of porch. A small front porch is shady and quiet as well. Harbourtown Golf Resort is six miles away just past the town of St. Michaels. There is one step up to the front door but no additional stairs or steps in the residence. There is one step down from the porch to the patio. 45-foot length pool with salt chlorinator and Roman steps. There are five lounge chairs at the pool. No guard on site and guests assume all liability for use of pool. The house is in perfect condition. The layout is open with plenty of room and also private areas which was great. The bed was comfortable which ranks high in my mind. The weather wasn't great part of the time we were there, but just sitting inside with the fabulous view was lovely anyway. Good location, close to St.Michael's and Easton shopping. Perfect family spot for relaxation and fun! Had everything you need! This was our first "non beach" family vacation, so we chose our spot very carefully. This house did not disappoint - in fact, it exceeded expectations. To start, cooresponding with the owners was a pleasure. They were quick to respond and even helped with some special accomodation requests we had. Upon arrival, the drive is gorgeous and the house/view is even better. The house is meticulously maintained yet still kid-friendly (we have 2 toddlers in tow!) and was even more beautiful and comfortable than the pictures. We had 2 families (us and our friends) and the layout of the house was perfect. Our friends were in the Master bedroom on one wing of the house, we had the 2 large bedrooms on the other wing (so our toddler could have his crib in his own room) and all of the bedrooms had full baths. The kitchen and family room in the middle of the house are gorgeous, fully stocked (aside from groceries, of course) and offer incredible water views. We found ourselves on the patio and dock, most of the time, for snacks, cocktails and just hanging out! We used the pool and kayaks daily and then took a short drive (about 5 minutes or less) into St. Michaels for dinner and shopping in the evening. We also took the ferry to Oxford for an afternoon which was amazing and definitely recommended. There are rafts and pools accessories in the garage, which was so nice with the kids, and a hammock to relax.. It was these small details that really created a relaxing and enjoyable time for us. You will not regret booking time at Edge Creek!! Thank you for staying at Edge Creek and we are glad this worked out for you and your youngest family members, too! Please come again sometime and enjoy more of the wonderful Eastern Shore! What more could you ask for in a vacation. We had beautiful weather in which to enjoy all of the amenities that our vacation house had to offer. We spent very little time indoors as we swam, kayaked, watched the stars from the front lawn, tubed in the river, and played many games of bocce ball. One of the most relaxing vacations we ever had. When we did venture out we enjoyed the ferry ride to Oxford and St Michael's. Thank you for sharing your beautiful home, we can't wait to come again. My family had a wonderful vacation week in this home, the pictures do not do it justice, the house is beautiful and the setting is amazing. We had a great balance of relaxing by the creek and trips into St. Michaels which is only 10 minutes away, and took the ferry over to Oxford for dinner at the Robert Morris Inn, the oldest Inn in America. Wonderful home and great location! Great house convenient to St. Michaels and Easton. This was our third rental in St. Michaels and easily the nicest, and cleanest, house so far. Perfect space for four adults and two kids. Owner was great to communicate with before, during, and after the trip. Wonderful views of the water from the family room. Nicely equipped kitchen with new appliances for for cooking breakfasts and dinners. Drinking water quality was good too. Didn't really need bottled water. Pool has a lot of floats provided and we were happy not to pack our own. Only got a couple hours of full sun each day and the water was a little chilly. Great views of Edge Creek from the pool. The dock was great for fishing, though we were less than successful at catching anything! Side porch was nice to get out of the sun, but screening it in would be a positive to keep away wasps and mosquitoes. We couldn't enjoy the porch as much as we would have liked. A couple of the bedrooms and bathrooms had numerous small spiders. They were easy to eliminate and the owner indicated this was not normal. As already mentioned, otherwise, the house was very clean. We really liked this house a lot and definitely recommend this vacation spot. We would not hesitate to rent this house again for any future vacations we make to St. Michaels. Please email owner with any questions about rates. 4% discount offered for payment by check. Checks are due at the same schedule and terms as listed above.